Nowadays, it is rare for an artist to release an old-fashioned album of "Southern music". A native of Mississippi, JF Oakes reverses the trend and offers us a strong and authentic record. With his warm voice, he takes us to southern territory with some very talented accomplices some of whom are not strangers like the organist Billy Earheart (who played with the Hank Williams Junior's Bama Band and the Amazing Rhythm Aces, names that speak for themselves) or the excellent guitarist Max Williams. Mister JF explores virtually every facet of this music that we love so much. Here are some examples. From the beginning, "Low down" sends us in full face some fast-paced country/rockabilly with a great country-rock guitar solo. Just behind, the classic "Southern rock" "The weight of love" makes us stomp. "Gypsy queen" proves to be very catchy with its "backbeat" in a Bo Diddley style during the verses and its melodic chorus. The syncopated soul blues "Bless your heart" comes with a medium tempo with backing vocals. "Lucky" is very strong. This is a Charlie Daniels' style funky blues (in the genre of "Trudy") with backing vocals and brass and two very good organ and six-string solos. The best title on the album is undoubtedly "One-sided story", a slow melodic southern ballad on which the voice of JF Oakes sounds wonderful. On the other hand, we deplore the absence of a guitar solo. Pity ! There are two other good songs: "Everybody comes with me" (in the "Southern country" spirit with an excellent axe solo) and "Love or hate (no fool)" (a "Southern soul" song that swings, a little in the style of the Allman Brothers Band). Finally, hats off to "The weeping willow (a civilian war lament)" that speaks about the last wishes of a soldier during the Civil War. Apart from the bass and the drums, the arrangement gives prominence to the acoustic style (acoustic guitar and banjo). A pedal steel harmoniously decorates this song that reminds me the Marshall Tucker Band. Congratulations! 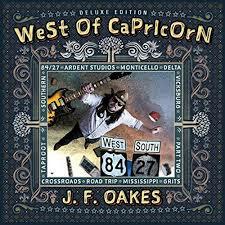 Here is a great album coming directly from Mississippi and reminiscing Dixieland. Let's just hope that his health problems will not stop JF Oakes from recording another record and coming back on stage. Southern spirit will never die !